Overview - As Andy prepares to depart for college, Buzz, Woody and the rest of his loyal toys are troubled about their uncertain future. After being accidentally thrown away, the toys land in a room full of untamed tots who can't wait to get their sticky little fingers on these "new" toys. It's pandemonium as they try to stay together, ensuring "no toy gets left behind." Meanwhile, Barbie comes face to plastic face with Ken (yes, that Ken). Up until now, aside from 'Toy Story 2,' Pixar had stayed away from sequels. This was an even more amazing feat when you realize every one of their movies, from 'Monsters Inc.' to 'The Incredibles' could have spawned a franchise, with numerous sequels generating endless box office and merchandising dollars. Still, Pixar decided to go with original story after original story, giving us movies populated with lovable characters and overwhelming heart. So naturally, when I head that Pixar would be doing another 'Toy Story' movie, I became very apprehensive. Pixar has built itself up into the most famous and recognizable production house in the US. Like Roger Ebert said, they're the only movie studio that also has celebrity status. They've spoiled us for years with their amazing, heartfelt storytelling. Hearing they were now returning to the 'Toy Story' franchise was a bit disappointing. There's always apprehension involved when sequels are concerned. Are the old characters we've grown to love going to be given enough screen time? Are the new characters that will inevitably be introduced going to overshadow everyone else? Will the story seem watered down since we've already been to the well a couple of times before? These are all legitimate fears, but I should have had faith in Pixar. They know what they're doing. Andy is heading off to college, and Woody, Buzz, and the rest of the gang face the very real possibility of being neglected for the rest of their lives. When Andy's mother tells him to gather up his stuff and either put it in the attic for storage or in garbage bags for the dump, the gang prepare to take up residence in the attic. They all know one thing for certain, they don't want to end up as trash. Of course, after a little mix up, the bag of toys is mistaken for garbage. After escaping the garbage truck, the toys think they'll be better off donating themselves to a nearby daycare where kids will play with them everyday. Woody pleads with them. He tries to tell them that Andy didn't mean to throw them away, it was a mistake, but they don't listen (if I have one gripe about the movie, it's that the not listening to Woody storyline has been played out). Most of the movie takes place in Sunnyside Daycare, where Andy's toys soon learn it isn't as happy a place as they had thought. After being relegated to the Caterpillar Room, Buzz, Jessie, Bullseye, and the Potato Heads are repeatedly bashed, crushed, and thrown by terrorizing toddlers. This is definitely not what they had in mind. They meet a whole host of new characters, who are used to perfection here. The worry here is always that the new characters will feel stuck into a movie just to boost merchandise sales. Here the new characters instantly fit into the franchise, especially a suave-acting Ken Doll voiced by Michael Keaton. Even after all my apprehension and worry, I have to say that I loved 'Toy Story 3.' 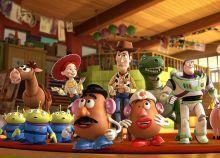 It carries on the legacy of Pixar and the 'Toy Story' franchise. It's a perfect bookend to one of the best animated series of all-time. The climax alone is more exciting and thrilling than many of the action movies that came out this year. The end is touching and sweet, harboring that same choked-up emotion that 'Ratatouille' inspired. 'Toy Story 3' has everything you could want from a new 'Toy Story' film. Is it as good as the first and second films? Not quite, but it's still one of Pixar's best. 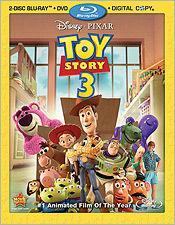 'Toy Story 3' comes to Blu-ray in one of Disney's combo packs. This time four discs make up the package. Two BD-50s are included. One houses the feature presentation, while the other is strictly used for a bevy of bonus features. A DVD and Digital Copy are also included. It's almost redundant to review the picture quality on this. Was there any doubt out there that 'Toy Story 3' presented in beautiful 1080p would be anything less that demo-worthy material? I didn't think so. This is the same level of perfection we've come to expect from Pixar's movies in HD. The colors burst off the screen. Detail is ramped up, making the movie even more realistic looking than its predecessors. Take for example the finely chopped up pieces of garbage at the dump. Each one of them has its own look, consistency, and detail. Each piece of garbage, no matter how small, is distinguishable. Textures are simply amazing, like they used look of Lotso's strawberry scented fur. Or the numerous patterns used on Ken's wide variety of wardrobe choices. You can actually see the stitching and ribbing on Jessie's hat. As for technical anomalies, there are none. I thought that I noticed a bit of banding in the sky and some aliasing during the end credits on the boom-box Jessie uses to play Spanish music, but if you aren't looking extremely closely for those then you won't see them. Truth is, the picture is as pristine and clear as they come. This is just an amazing looking release all the way around. There's nothing much more to say about it other than it's one of, if not the, consistently best looking releases we've had this year. You knew that the picture was going to look great. That's pretty much a given when it comes to Pixar on Blu-ray, but what about the audio? Let me tell you something, the audio is the real treat on this release. 'Toy Story 3' comes complete with an enthralling 7.1 DTS-HD Master Audio mix that will keep you engulfed from the opening scene until the end of the credits. The soundfield is filled with lively noises and ambient sound that will totally immerse you in the story. As soon as the toys get to the daycare center the masterful ambiance takes over. Screaming kids encircle the soundfield as they run amok. Clinks, clanks, and clangs are delivered with precision as the toys are greeted by a whole host of new toys. During a flashback with a rainstorm individual droplets can be distinguished. It's simply stunning. Panning effects work wonders, especially as the 7.1 mix takes into account the two side channels. Now Woody is soaring high above you as the wind pushes him higher and higher. His screams and "Woos" are carried throughout the mix, placed exactly where they should be. When it comes time for the big final action-packed ending the mix is cranked up to a bass-laden LFE slug-fest that will catch you by surprise. All this time the soundtrack has been subtle and nuanced, giving us an extremely detailed but reserved audio experience. That all ends when the toys get to the dump and try to escape permanent doom. Room-shaking bass is released from the sub, but never so overwhelming that it takes over and drowns out the dialogue. Just like the video presentation, this audio presentation is top-notch demo-worthy material. From the restrained, but detail-oriented beginning to the bass-rumbling ending this is another wonderful HD audio experience provided by Disney and Pixar. The Gang's All Here (Disc 2, HD, 11 min.) – We get re-introduced to all the original voice characters. Feels pretty promotional, but it's fun to see Tom Hanks and some of the new voices like Timothy Dalton, Bonnie Hunt, and Michael Keaton recording their voices in the sound studio. 'Day & Night' Theatrical Short (Disc 1, HD, 6 min.) – Like always, the short that ran before the movie in theaters is included on the disc. One of my favorite shorts to date, they just get better and better. Buzz Lightyear Mission Logs: The Science of Adventure (Disc 1, HD, 5 min.) – Buzz, Hamm, and Rex talk about how space travel has progressed. Similar to the features that are found on the other two Blu-rays for parts one and two. Toys! (Disc1, HD, 7 min.) – A brief discussion from the animators talking about how hard it was to create so many new characters and toys for the new movie. Studio Stories: Where's Gordon? (Disc 2, HD, 2 min.) – A little story about a hidden office created at Pixar's new building by Andrew Gordon. Studio Stories: Cereal Bar (Disc 2, HD, 1 min.) – Pixar has a whole room devoted to cereal for their employees to enjoy. Another story that makes us all feel bad that we don't work there. Studio Stories: Clean Start (Disc 2, HD 3 min.) – A story about how everyone at Pixar shaved their hair, and how they finally got Lee Unkrich to shave his long flowing locks. 'Toy Story 3,' in my mind, is one of the best Pixar films. They took their time with this movie and didn't rush it. I still think it's a peg below one and two, but it still chokes me up at the end. The video and audio are demo quality and there's a huge helping of extras that will keep you entertained for hours. In short this is a must own Blu-ray.